We offer you a unique opportunity to acquire experience in different areas of expertise, in an international and multicultural environment enhancing your networking possibilities. In addition, you will have the chance to acquire significant knowledge of the Organization of American States (OAS), its mission, pillars, structure and projects in the hemisphere. The Organization of American States (OAS) is the main political forum of the Region that promotes and supports Democracy, Human Rights, Multi-dimensional Security and Integral Development in the Americas. The OAS seeks to prevent conflicts and to bring political stability, social inclusion and prosperity to the region through dialogue and collective actions. Work and college are very different realities. At work, your supervisors will not give you an opinion about your performance as often as you are used to, and do not regularly ask for your opinion. Most likely you will not be asked to solve vital issues during an internship. The internship is an opportunity to observe and learn. Introduce yourself to your co-workers and share your aspirations with them. Socialize during lunch. Participate in activities outside the office. Create friendly relationships during the internship. Arrive on time. Dress appropriately for work. Give 100%, on whatever task you are required to do. Be humble … you are not expected to know everything. Try to understand how your actions have an impact within the macro view of the Organization. Apply the theories you learned in college. Your input can help improve processes and create change. What makes a process efficient? In what way can you positively influence the work of the Organization? How has this experience changed your life? Ask yourself how you can help and improve the work in your department. You can make a difference. Give and ask for feedback and contribute. The OAS Internship Program does not offer any payment or stipend. Interns are responsible for all costs associated with travel, housing, maintenance and health insurance. All interns are required to participate in a weekly orientation program coordinated by the Department of Human Resources. A certificate of completion of the internship will be awarded to interns who have attended at least 80% of these activities. As part of the OAS Internship Program, interns are required to fulfill a performance evaluation. This evaluation is done at the end of the internship session. If you live or are studying in the United States with a student visa (F-1) or are a permanent resident or a US citizen, you can participate as a part-time intern (at least 20 hours per week). If you have a visa sponsored by the OAS (G-4) you must participate in a full-time basis (40 hours per week). All interns are required to submit valid proof of insurance before starting the internship. If you have participated in the OAS Internship Program once, you cannot apply again or be accepted in any future internship sessions at the OAS. The information handled by interns during the performance of their duties is confidential; it belongs to the General Secretariat of the OAS and cannot be used for personal or professional gain. Our Application System is currently closed. GPA of at least 3.0 out of 4.0 in the American scale (or equivalent). Undergraduate students must be finishing at least their second year of studies. Be proficient in two of the four languages of the Organization (Spanish, English, French and Portuguese). Electronic Application Form (click here). o	If your internship will be accredited by your academic institution, please include an official letter from your institution. Curriculum Vitae with Cover Letter (Resume without photo). Incomplete applications will be on hold until all the requirements arrive to the OAS Department of Human Resources. Because the Organization of American States (OAS) is a multilateral organization that will allow you to have a real experience within the international scenario. Additionally, it is the most important political forum in the Western Hemisphere. Because the Internship Program is the adequate environment for learning and acquiring professional experience. Specific objectives are defined between the intern and the supervisor during the first week of the internship, which are monitored and evaluated at the end of the session. Because the organization offers a weekly orientation program that will strengthen your professional and personal skills. Because the OAS Internship Program has 30 years of experience, which has enabled us to improve the processes so that it fits the evolving needs of the interns. Where are the internships held? The OAS Internship Program has been taking place at the headquarters of the OAS General Secretariat in Washington, DC for more than 30 years. However, in 2011 the Program was expanded to the offices in the OAS Member States. Which dates/sessions may I participate in? Students at the undergraduate and graduate level as well as young professionals, regardless of their nationality (it is not required to be a national of an OAS member state). Undergraduate students must be completing their second year of studies. The Internship Program has no age limit; however, it is aimed at undergraduate, graduate students and young professionals. The average age of participants is 24 and the work assigned corresponds to this profile. May I be a part time intern or must I be a full time intern? Interns that have a visa sponsored by the OAS must be full time. Those who are United States citizens, legal residents, or have a student visa may be part time interns. The OAS Internship Program is unpaid. Its purpose is to provide interns with a professional experience and to meet academic provisions when required. Interns are responsible for all costs associated with housing, health insurance, and any other costs for the duration of the internship. As a foreigner, if I travel to the United States exclusively to do the internship, may I have a complementary job elsewhere? Any intern who has a visa sponsored by the OAS must be a full time intern and cannot accept any other job outside the OAS. If my country is not a member of the OAS, may I participate in the Program? Yes. The program has no restrictions in terms of nationality. In what areas or departments can I do the internship in Washington, DC? All areas or departments within the General Secretariat of the OAS have the potential to bring in at least one intern per session. The areas for which you can apply are visible in the electronic form you must complete for applying. The OAS organizational chart is available in its website. What is the work of interns at the Country Offices? Interns at Country Offices work on different projects according to the priorities and needs of each Office. What are the weekly meetings in Washington DC about? These meetings are about different topics of interest within the OAS. Each meeting has a different speaker who offers an overview of a particular subject or project that is relevant to the Organization. 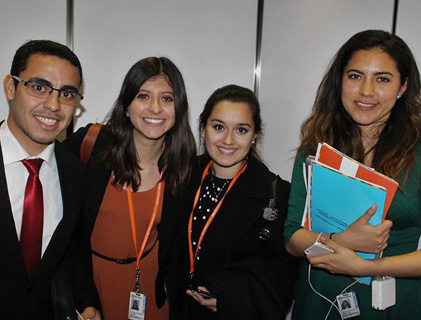 As part of the weekly meetings, the interns also have the opportunity to visit other international organizations in the area such as the World Bank, the Inter-American Development Bank (IDB) the Pan-American Health Organization (PAHO), among others. What are the activities in the Country Offices about? Interns in National Offices will participate in an online complementary program of weekly activities related to the OAS, focusing on its different projects and pillars. Do I need a valid visa to enter the United States at the time of application? No. In order to participate in the OAS Internship Program in Washington DC, a special visa is required that may be requested upon official acceptance into the program. What is the equivalent of 3.0 out of 4.0 in other grading scales? It is determined by the candidate’s grading scale in his/her country. It means being in the top 25% of the corresponding scale. For example, if the grading scale is 100, the candidate should have an average of at least 75. Is it necessary to translate all supporting documents into English? No. The documents are accepted in any of the four official languages of the Organization (English, Spanish, French, and Portuguese). What is the primary language used in the Washington DC Internship Program? Part of the requirements to apply for the Internship Program is to have knowledge of at least two of the four official languages of the Organization (English, Spanish, French and Portuguese). However, most of the activities/ meetings are conducted in English or Spanish. What is the primary language for the internships in the Country Offices? The online activities for the Country Offices are available in both English and Spanish, so it is necessary to be proficient in at least one of these two languages. It is also necessary to have command of the language of the country where the internship will take place. Is it necessary to certify my second language? (E.g. TOEFL)? Certifying a second language is not a prerequisite for applying to the internship. However, the area that is interested in having you as an intern can seek certification if they wish, or conduct an interview in that language to evaluate the individual’s proficiency level. What are my responsibilities as an intern? Comply with the tasks and schedule assigned by your supervisor. Attend at least 80% of the meetings/weekly activities of the Program. Respect and comply the Internship Agreement. In what language should I complete the application form? The form is designed in English but may be answered in any of the four official languages of the Organization (English, French, Spanish, and Portuguese). However, it is recommended to complete the application in English or Spanish. What should I answer under “Visa Type” on the application form? You should indicate if you currently have a valid visa for the United States (tourist, student F-1, or J-1). If you have no visa you can respond N/A (Not Applicable). How do I know if I was selected? Only selected candidates will receive an official letter of acceptance via email issued by the Coordination of the OAS Internship Program. Is it possible to know how long will it take to be informed if I was selected? All selected interns should have received their letter of acceptance issued by the OAS Internship Program approximately one month before the official start date of the session. How many interns are selected? The number of interns allowed per session is limited based on the headcount of the Organization. The number may vary but on average there are 60 to 80 interns per session. If I apply for the internships and I am not selected, may I re-apply? Yes. You may apply as many times as you want. If I do an internship, may I reapply to do an internship in a different area/department or in a Country Office? No, you can only be an intern of the OAS once. The regulations of the Internship Program prohibit repeating or extending internships. Does the Internship Program offer financial support for living expenses during my internship? No. Interns are responsible for their own living and transportation expenses and for their medical insurance during the period of their internship. Where can I find information about housing, weather, airports, and medical insurance in Washington D.C.? We strongly recommend joining our Facebook Group where you can find other future interns that are also looking for a place to stay or share, and former interns that could offer recommendations about where to live in Washington DC. WINTER in D.C. lasts from December to the beginning of March. Average temperatures range from 20º to 50º Fahrenheit (between -6º and 10º Celsius). SPRING in D.C. lasts from late March through late May. Temperatures during the spring are often between 40º and 70º Fahrenheit (between 4º and 21º Celsius). SUMMER in D.C. lasts from June through August. Temperatures are generally between 60º and 90º Fahrenheit (between 16º and 32º Celsius). FALL in D.C. lasts from September through November. Temperatures are generally between 40º and 70º Fahrenheit (between 4º and 15º Celsius). RONALD REAGAN WASHINGTON NATIONAL AIRPORT (DCA) This airport is located in Arlington County, Virginia, and it is the closest airport to the Washington D.C. area. The airport is connected to the metro system and offers taxi and shuttle services. For this airport's location click here. DULLES INTERNATIONAL AIRPORT (IAD) This airport is located in Dulles, Virginia, 26 miles (42 kilometers) from Washington, DC. It offers shuttle and taxi services and there is a close metro station (silver line). For the location of this airport, click here. BALTIMORE WASHINGTON INTERNATIONAL THURGOOD MARSHAL AIRPORT (BWI) This airport is located just outside of the city of Baltimore in Maryland, 32 miles (52 kilometers) from Washington, DC. It offers shuttle and taxi services and there is a train station close to the facilities of the airport. For the location of this airport, click here. All interns working at the General Secretariat of the OAS must acquire medical insurance with coverage in the country where they will do their internship and for the entire session. Valid proof of insurance should be sent to the Department of Human Resources before the beginning of the internship. GPA of at least 3.0 out of 4.0 in the American scale or equivalent. This means to be in the 25% top of the class. Students at the undergraduate and graduate level as well as young professionals can apply. However, undergraduate students must be completing their second year of studies. Two letters of recommendation, one preferably (not mandatory) from a professor within your area of expertise. The second letter from an employer or another professor. Please include contact information (phone number and email) of the person signing the letter. If your internship will be accredited by your academic institution, please include an official letter from your institution..
Curriculum Vitae with Cover Letter /Resume without photo. Note! CVs with picture will not be accepted and will disqualify your application. Letters of recommendation that cannot be given directly to the student can be e-mailed to internships@oas.org. Where would you like to do your internship?